What if you could go on vacation in your mind, even just for a moment? And what if that resulted in a more harmonious day? I just tried it, and I hope you will too, after you read the post I wrote on vacation last summer. I’m on vacation this week, a vacation that I anticipated and now savor. I am graced by rest, beauty and pleasant activities. When my pace slows enough, I’m able to hold a perspective which seems inaccessible on the usual busy days of life. Oh, even on vacation I feel moments of stress, due to anything from a minor work request to misplacing the rental car keys. But the difference is that on vacation, I almost always observe it and decide if it’s worth the emotional energy. Even when it is, there are energetic bookends of peace that keep stress in its proper place. 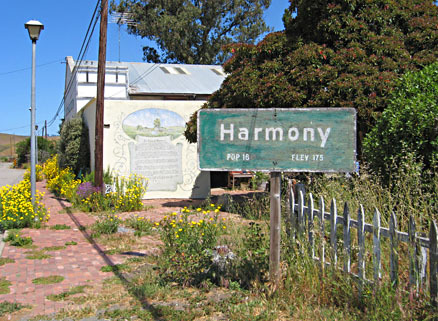 There’s a very small town near where we are in California, called Harmony. We’ve visited there three times this week, as it’s the home of one of our favorite wineries. We picnic on their lawns with our dogs, enjoying cool breezes, gorgeous scenery and the scent of lavender growing in the gardens. (And yes, good wine, of course). Early this week, I decided that “harmony” was my intended state of being. As I began to write this post, I assessed my performance in that harmonious state. At first, I felt a touch of self-judgment, as I knew I have not been what I previously defined as “harmonious,” 24-7. Then I googled the word. Amazingly, harmony results from the balance between tense and relaxed moments. You musicians know this of course. But for me, and for the rest of you, this information is powerful. Harmony exists when there is wholeness and acceptance of the human experience. There’s no doubt that I will again lose my car keys, as well as experience many other so-called stressful moments. My intention is to bring harmony home with me and weather them to the sound of beautiful music. How about you? As we laughed and played in the California surf and sand, I felt pure joy. Then, suddenly, I remembered the pain a friend in Arizona is experiencing as she grieves the loss of a dear companion. Once again I was reminded of the seeming contradictions in this experience of life, and our ability to ride the waves of change with resilience and grace. Our beach dance was a reminder to keep the faith. Whether at this moment you dance or mourn, it is yours to either embrace or resist. At least for today, I’m choosing to dance.